DeQuan Watson: Want More Dominaria Preorders? New draft environment, new tools for Standard, new narratives—Dominaria may recall Magic's early days, but it is newness that will drive demand, and it's likely to peak between previews and the early post-launch period. Some stores will do half of their total sales in the first two weeks. So, in a way, the easiest time to make sales is before the set is even out. By focusing on preorders, you can cash-in on the hype when it is at its highest. With buzz crescendoing as we speak and your first official sales opportunity coming at Prerelease, try these three simple tactics to capitalize on demand and capture those preorders. To a retailer, the benefit of a preorder is obvious. You sell more boxes. You predict demand more accurately. You maybe get a little cash earlier than expected, and you can put that cash back into more product. To the player, the benefit is less obvious. It can be tough getting players to commit to a box before the set is out. The trick is to show them the benefit. 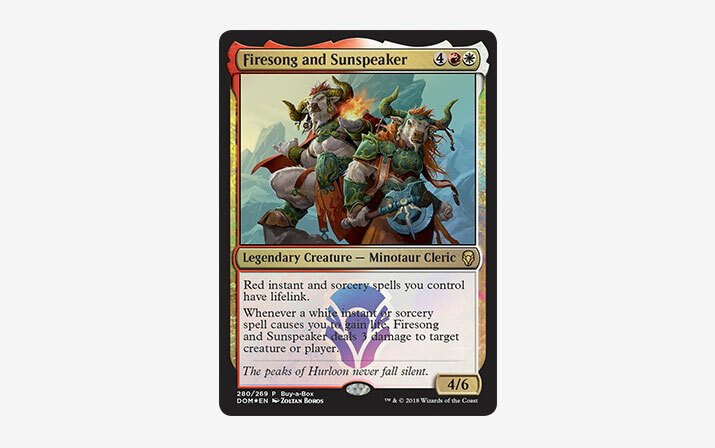 And 2) The Buy-a-Box card, Firesong and Sunspeaker. It's rare, it's foil, it's legal in Standard and Commander, and it's only available through the Buy-a-Box promotion. Of, course you can stack preorder benefits on top of these. Offering fun bonuses can get people talking and create a culture of players looking forward to preordering with you. Midnight pickup, for example—being able to crack packs before their friends and know what they need to trade for is appealing. Believe it or not, a lot of your customers aren't aware you take preorders. Others may be curious, but afraid to ask if they don't see anything stating you do. Put up signage to get the word out. Be clear on your price and release dates. Put the signage in two places: your play area and near the register. This gives you one last chance to close the deal while they're already in a spending mood. Post notices on all your social media outlets twice a week leading up to release. We've got several marketing tools to help with this. On our marketing materials page, you can get images, set logos, product shots, and other tools to make more professional-looking posts, including a whole suite of assets specific to the Buy-a-Box promotion. One of the worst things you can do is fall through on a preorder. Requiring a non-refundable down payment helps. This increases the odds that they'll be there to pick up product. This also gives you a better idea of how much to order. You'll reduce your risk of getting stuck with a surplus. Some stores take preorders without money up front. That's fine, but it's less of a commitment and runs more of a risk that the customer cancels. Free preorders tend to work better with a reward to increase motivation to follow through on the commitment. Order enough product to take care of your customers beyond preorders. Even with your best efforts, there will be customers that come in on release day expecting to buy product and forego the preorder process. At my store, preorders usually made up 25–30% of my initial sales. Preorders are a great way to guarantee sales on release of a new product. Make sure your players know your preorder process and keep the process simple and easy. Be creative in your offerings to make your store stand out and be the preferred place to buy product.